First of all we like to make clear that in the past decades there have been NO earthquakes on Crete that have caused serious damage. The last big earthquake in 1953 nevertheless caused major damage across Greece, and triggered big social changes due to emigration following loss of life and property etc. It is one reason why, in some areas, there are no old houses left. On March 18, 1953 the major Yenice-Gonen earthquake strikes West Turkey, and 250 people die. On the Ionian islands it destroyed most buildings on Zakynthos and the nearby island of Cephalonia, with 7,2 on Richter's scale. More than 476 people were killed. It is said that this earthquake affected Crete also, with for instance some damage to the water cisterns in Loutro and some roofs collapsing. From: Wikipedia. Click for more earthquake lists. But earthquakes do happen sometimes on Crete. 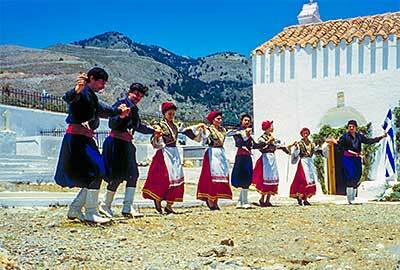 As been mentioned Crete is an 'active' area with small earthquakes every year. The last significant earthquake was in 1994, 6,3R as I remember. I was standing on my patio at the time and suddenly instead of standing on concrete I felt that I had jumped onto a bed. I had water in bowls (for the cats) and this started sloshing from side to side, spilling out of the bowls. A little later I visited an office on the 5th floor of a block in Chania where there was a free standing iron decorative stand against a wall and I could see marks on the wall where it had swayed from side to side about 10cm or so. However, there were no reports of severe structural damage, just odd bricks and tiles in the road from the tops of old buildings, and a few old garden walls down. I remember at the time feeling that there was less damage than happened a few years previously in England when there was a hurricane. One must remember that the Richter scale is based upon energy released and this is not always a good indication of 'effect'. An structural engineer friend said that the Turkish eathquake was very long in duration as these things go although the R value was not too high. The earthquake in Athens was only 5.9 but it was very fast moving which exagerated its impact. The building regulations in Greece are very strict with respect to Earthquake resistance: Accoring to my friend amongst the most stringent in the world. To obtain planning permission you must supply a complete structural 'static' analysis of the foundations and skeleton to show that it will withstand earthquakes. All factors are specified in the plans, the sizes of columns etc, the steel and Grade of concrete are all specified. The problem is that the building must be constructed according to the design and with good building practices. For instance the owner, or the builder may decide to save money by perhaps using less steel or by using a lower strength grade of cement, or may not excavate enough to ensure solid foundations. The builder may add water to the specified mix of concrete to make it easier to work, he may not place the steel correctly within the concrete formwork, he may not 'cure' the cement properly (keeping it wet during the setting time, perhaps 5 days). These things should be checked by the engineer responsible for the building, but ... I believe that in Athens the Architects/Engineers and builders responsible for the construction of the buildings that collapsed are currently being sought. Perhaps we shall learn more. Of course quite a number of people decide to build without obtaining planning permission, but that's another story. Another problem, particularly with commercial buildings, is that the owners may decide to modify them when business need change, perhaps without consulting an Engineer to question the impact of the changes. With respect to the steel often seen protruding from the tops of buildings, as I think someone else has said, the Greeks are very family oritented, when they build they do often plan for further stories for their children eventually. If they can afford it they build beforehand and rent-out the upper floors, always intending their children to eventually live there. Well built old houses often resist earthquakes but in a completely different way than new buildings. Problems arise when they are not properly maintained or are 'renovated' in a 'modern' way using large quantities of concrete which tends to work against their intrinsic resistance modes." Most of them aren't even noticed, some are strong, but since they happen far below sea level, no damage is done to the surface, apart from maybe an old building partially collapsing. 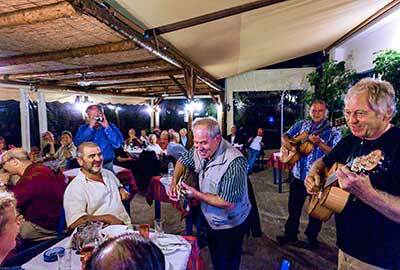 Since some decades the Greek government has issued severe earthquake building regulations, which are served everywhere. All buildings should be made out of armoured concrete, to survive a 'normal' earthquake of 7 on Richter's scale. Earthquake Severity This is logarithmic scale, meaning that an increase of one unit - for example, from 3.5 to 4.5 - represents an 10-fold increase in the amplitude of the seismic waves and approximately a 30-fold increase in the energy released. Many people on Crete have worked hard to save money for building a house or hotel etc. and it is in everybodies interest to follow these regulations. To look in the historical library of Earthquakes, click here. The Thera blast - twice that of Krakatau and 40 times that of Mount St. Helens-destroyed the island's civilization, and through tidal waves, destroyed Minoan cities on surrounding shores, especially on Crete. Beneath five distinct layers of pumice and ash lies evidence of this cultural and spiritual center of Minoan culture: pastures then cultivated with crops and orchards, each field divided by rock walls and shelters; uncultivated uplands with wild animals; gentle streams and valleys incised into soft volcanic rock; multistoried buildings with internal plumbing; and country villas scattered across the landscape." - Dr. Floyd McCoy, in Ground Truth, Earthwatch Research Report ". At the time of the first Thera Conference [Athens 1971] excavation had clearly documented a widespread 'destruction horizon' on Cretan sites datable to about the middle of the 15th century B.C. The date was deduced from the pottery found in the burned and flattened buildings, pottery which includes fine specimens of the style known as Late Minoan IB. Prosperous towns like Mochlos, Pseira, and Gournia were wrecked and abandoned. The palaces at Mallia, Phaestos, and Kato Zakro fell, and were never rebuilt. The era of the 'villas' - opulent mansions serving as district administrative centres - came to an abrupt end. The great palace at Knossos survived the disaster, but suffered damage, and was rebuilt and redecorated in a rather different style. The map is almost self-explanatory. South of the Islet of Gavdos, following the South coast of Crete, is 2400 meters deep in the Libyan Sea the break line or trench of Ptolemeus. There are three types of plate boundaries on the surface of the earth: divergent, convergent and transform. Divergent boundaries are two plates which are moving away from each other leaving room for material from the mantle to seep into the space and form new sea floor. Convergent boundaries are plates which are moving towards each other causing one plate to submerge beneath the other. And transform boundaries are two plates which are sliding past each other without much disturbance. South of Crete are two zones with convergent boundaries. The most near, the Ptolemeus trench, is an oceanic-continental convergence: this occurs when the denser oceanic Libyan Sea plate subducts beneath the less dense continental (Cretan) plate creating this trench. Once the subducting oceanic crust reaches a depth of about 100 kilometers, melting of the crust and the overlying mantle begins forming a magma. 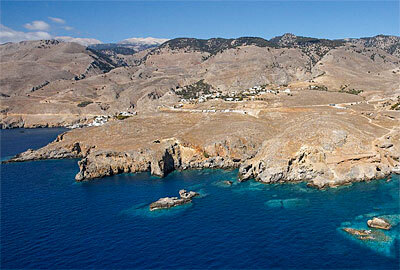 Some of this magma is pushed to the surface resulting in volcanic eruptions (Thera/ Santorini). In fact the south coast of Crete is pushed up by the Libyan Sea plate. Although VERY slowly, one can see clearly nowadays the old sea level, being about 150 cm above current water level! 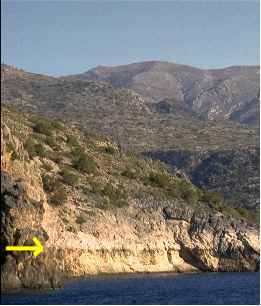 (110 km NW of Chania ; 27 km NE of Kithira) on January 8, 2006 that shook all Greece and Crete, but fortunately did not do much harm, because the quake was 75 km below sea level. In Greece there are appropriate geological conditions for the occurrence of large earthquakes, similar to that of Japan. However, if there is an earthquake somewhere in the world tomorrow, it will be a coincidence and not related to the earthquake in Japan. This is underlined in a statement to Haniotika Nea newspaper by Professor of Natural Disasters, director of the Laboratory of Natural Hazards and Coastal Engineering, University of Crete and President of the Greek Center for Marine Research (HCMR), Costas Synolakis. At the same time, he explains that the so-called Hellenic Arc that passes south of Rhodes and Crete has caused, in 365 AD and in 1303 AD, large earthquakes. The magnitude of the earthquake of 365 AD estimated at 8.3 to 8.5 Richter. Further in his statement, Mr. Synolakis, who has also served as director of the Tsunami Warning Centre of the University of Southern California, USA, says: 'The earthquake of magnitude 8.9 in Japan and the still unfolding tragedy touched even us who know very closely the effects of tsunamis on coastal areas. At the same time, it sparked questions in the Greek media and blogs, whether such a large earthquake could affect the seismicity elsewhere and especially in Greece. The answer is simple. Naturally a large earthquake triggers other earthquakes: these are aftershocks. They might trigger earthquakes on adjacent faults. The earthquake of magnitude 9.2 in Sumatra, 26 December 2004, which brought a tsunami to the forefront of global concern, stimulated fracture to the southern tip of Sumatra and three months later there was a magnitude 8.6 earthquake. One of the ten largest ever measured. But there is no physical explanation that forces us to assume that a large earthquake in the Pacific can generate earthquakes in the Mediterranean. Like the Pacific, the Mediterranean earthquakes happen, but until now we can not know the exact time. If it is an earthquake somewhere in the world tomorrow, it will be a coincidence and not related to the earthquake in Japan. At this point Mr. Synolakis adds: "Unfortunately, we only have 90 years experience in moderate earthquakes since seismographs were used first. Earthquakes caused by plate movements are on earth for millions of years. It is too early to draw conclusions, except to note how little we understand of earthquakes and tsunamis. Last year on February 27, 2010 was a magnitude 8.8 earthquake in Chile. It created large tsunamis that reached as far as Japan. It caused no other earthquakes in other parts of the world from this earthquake, which was almost the same size as that of Japan last week". To emphasize: "The question is not whether the recent 8.9 quake can cause earthquakes in Greece, but if in Greece are the geological conditions for the creation of similar earthquakes. The answer is unfortunately yes. The great subduction zone known as the Hellenic Arc which extends from the coast of Turkey, south of Rhodes and Crete, west of the Peloponnese, west of the Ionian Islands to Dubrovnik was in 365 AD and and in 1303 AD the cause of large earthquakes. The earthquake of 365 AD calculated from geological research at the University of Cambridge, presented recently at the University of Oxford, ranging in size from 8.3 to 8.5 degrees. For the earthquake of 1303 AD, there are as accurate as the earthquake in 365 AD to quantify the size, but it is generally accepted that it was more than 8. 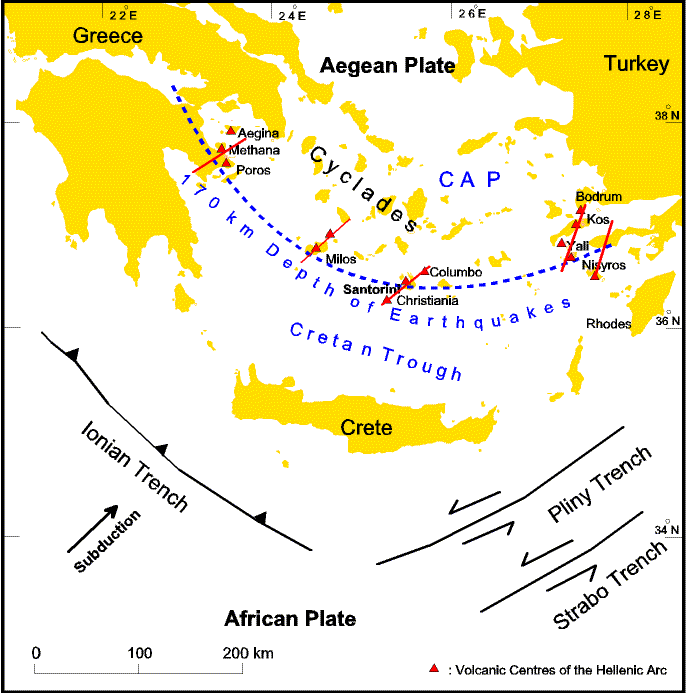 In the English counterparts, such earthquakes occur somewhere in the Hellenic Arc about each 800 years. (Magazine Nature, Shaw and others, 2008). The results from such a megaseismic event will depend on the focal depth and distance from land". "In conclusion Mr. Synolakis notes: As for how well they understand science-as-any potential seismic zone cause megaseismic: just a week before the earthquake in Japan, some foreign experts declared at a conference that mega earthquake could not happen on the west side of the Pacific. Enceladus* has decided to deny the very tragic way." During the battle between the Gigantes and the Olympian gods, Enceladus* was disabled by a spear thrown by the goddess Athena. He was buried on the island of Sicily, under Mount Etna. The volcanic fires of Etna were said to be the breath of Enceladus, and its tremors to be caused by him rolling his injured side beneath the mountain (similar myths are told about Typhon and Vulcan). In Greece, an earthquake is still often called a "strike of Enceladus". 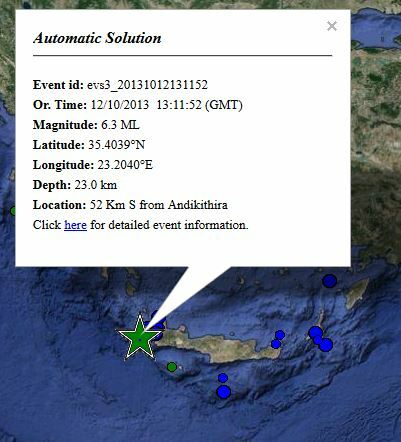 Large earthquake in Crete occurred at 16.11. According to the Euro-Mediterranean Seismological Institute, the earthquake was 6.4 on the Richter scale. 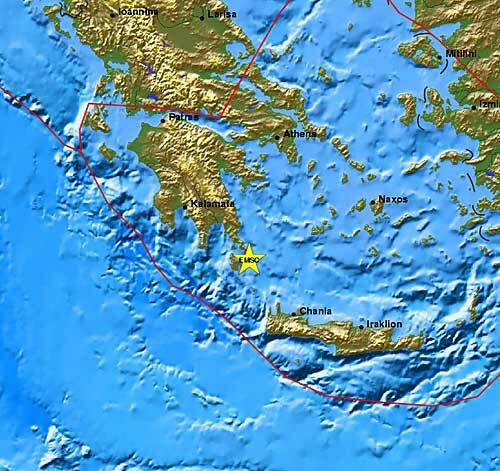 The epicenter was 67 km west of Chania and had a focal depth of 52 km. The earthquake was very noticeable and long lasting. Citizens cast terrified out of their homes. According to the information so far from services, there were no accidents, injuries or serious property damage from the earthquake. However problems occurred with abandoned homes. Half the roof of a derelict house in the street Seiradakis Amperia collapsed in the earthquake. On the way to Therissou is a lot of rock which almost closed access to one point, while landslides have occurred in many parts of the road network. Minor damage was caused to many shops and homes, though they are limited to falling objects or glass. An aftershock occurred a short time later with the same focus. More geodynamical background information for Greece is available from the Greek Institute of Geodynamics, a site very worthwhile to visit.